There were plenty of storylines with Monday’s series opener between the Los Angeles Dodgers and Cincinnati Reds, as it not only coincided with Jackie Robinson Day across the league, but also marked the 2019 debut of Clayton Kershaw and returns of Kyle Farmer, Matt Kemp and Yasiel Puig. 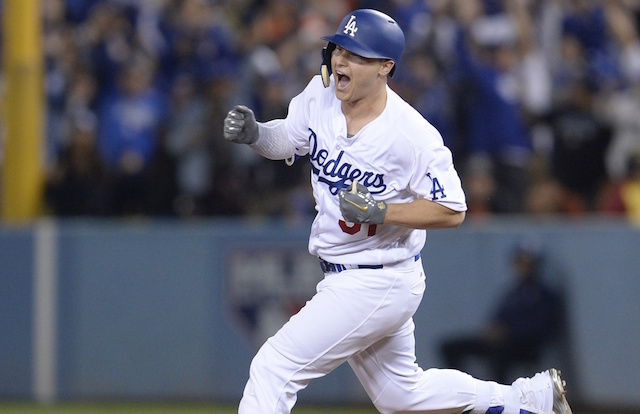 Kemp, Kershaw and Puig all played prominent roles, but it was Joc Pederson who stole the show with a walk-off two-run home run. That not only gave the Dodgers a thrilling 4-3 victory, it extended their home run streak at home to 30 games. Prior to that it appeared the night would belong to Kemp and Puig. After receiving a loud applause from the Dodger Stadium faithful, Puig launched a two-run homer to straightaway center field give the Reds an early lead. It wound up being just a blip on the radar for Kershaw as he proceeded to face one over the minimum from that point on. His fastball velocity sat around 90 mph and curveball had it’s typical bend. Puig struck out in his second at-bat, then led off the seventh with a single. Puig was responsible for two of five hits Kershaw scattered, and the left-hander finished with six strikeouts. The Dodgers cut into their deficit on Cody Bellinger’s RBI ground-rule double in the bottom of the first inning. Unfortunately for Bellinger his night came to an early end because of a 96 mph fastball that clipped him on his right knee. Bellinger initially remained in the game but was removed after Max Muncy struck out to end the third inning. Alex Verdugo took Bellinger’s place and wound up drawing a key walk in the fifth. That loaded the bases for A.J. Pollock, who himself worked a walk to tie the game. 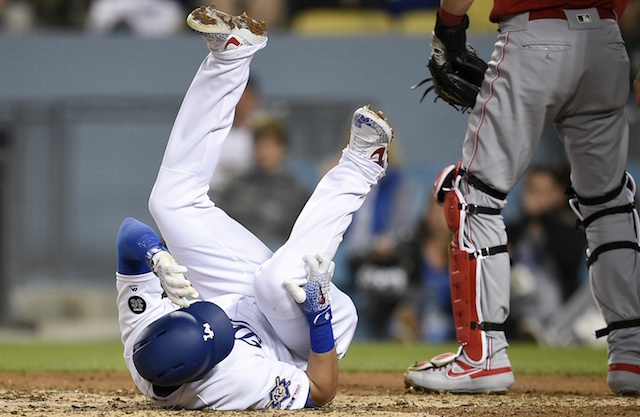 Luis Castillo managed to settle back in and kept the game locked at 2-2 by striking out Muncy for a second time and retiring Kiké Hernandez. Hours after Puig got the better of his former teammate, Kemp did the same with a go-ahead RBI single off Kenley Jansen in the ninth inning. That of course wound up being offset by Pederson’s blast.